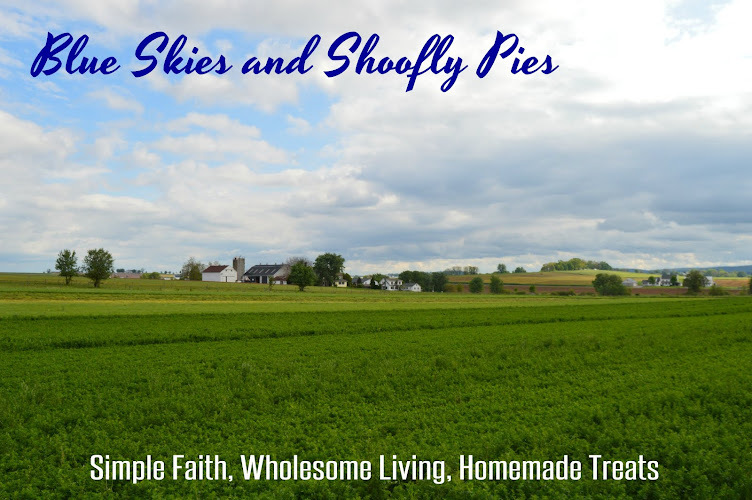 The title of this post was the name of a local bakery and luncheonette that has long since gone out of business, much to the dismay of muffin aficionados in this neck of the woods. It was a bakery that not only specialized in muffins, but produced muffins with the most delicious and original combination of flavors, and in a startling array of varieties. Also, the muffins were the size of your head, so you always had leftovers. Building on the guilty pleasure theme, I tend to view muffins as a rare breakfast treat and don't make them all that often. Last winter when we were snowed in I made a batch of lemon raspberry muffins, which were delicious. But it had been a while since I made my favorites. Since I think cooler weather is a nice time to bake and an even better time to experiment with the fall flavors that compliment these breakfast-cupcakes so well, here is one of my favorite easy-to-make muffins to share with you. Preheat oven to 400. 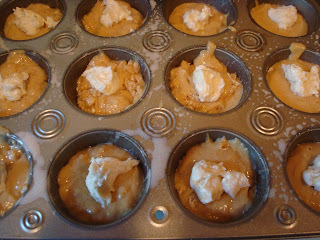 Lightly coat 12 muffin cups with cooking spray. Topping: In a small bowl, stir together cream cheese, 1 T of sugar, and vanilla until blended. Set aside. Muffins: In a large bowl stir together flour, sugar, baking powder, and salt. In another bowl stir together milk, egg whites, oil, lemon peel, and vanilla. Make a well in the center of dry ingredients, and stir just to combine. Spoon batter into prepared muffin cups. Top each muffin with a rounded teaspoon of cheese topping, divided evenly. Sprinkle the remaining tablespoon of sugar evenly over tops of muffins. Bake for 15-20 minutes. Remove muffin pans to wire rack and cool for five minutes before removing muffins from pan. 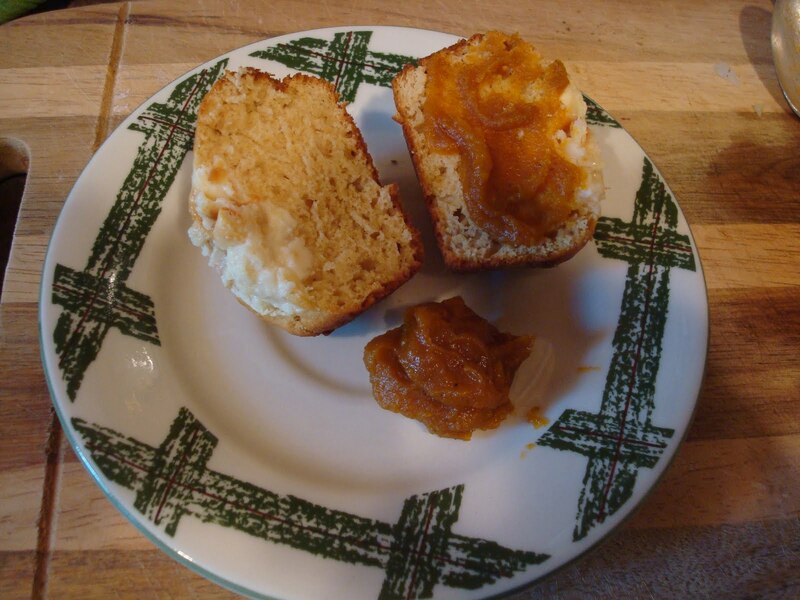 Make it extra nice by eating it warm with pumpkin or apple butter. When the butter blends into the warm cream cheese topping, it's an extra treat! What an unusual idea! I can think of lots of different muffin recipes that would be further glorified by a topping of baked-on cream cheese. Thank you for the recipe! I love baking in the cold months and muffins go over very well in this home. Those look SO good! I have everything to make those except the lemons and I can pick those up pretty quickly. Here's my question ~ is 1-1/4 t. lemon peel like what you would get from a lemon zester? I have a zester (unused, no surprise) and guess I would use that? Or would I use a grater and get the lemon peel that way? I guess I could google it. Can't I just use a tsp. of lemon extract - I know I have that. I'm on vacation next week and these are on the menu!! Beth- I just use a grater. I am sure you could use lemon extract, but I'm unsure what the amount would be. A 1/4 teaspoon, maybe? Try it and let me know! Merci! I tried it and it's great. My daughter loves them too. Bless you. Wow... those look yummy. My favorite danish has cheese and almonds. These look very rich, but when better to eat a muffin than in the morning... that way you can run it off all day. I'm gonna take BAT Mom's suggestion and try this topping on some blueberry muffins. By the way... I tried the squash seeds and I think the seeds need to be the bigger sort. Seemed like a lot of husk and no innards... they did taste good though.